Food is such an important part of our lives, so I’m always curious about its portrayal in games, especially the stranger dishes. This piece originally appeared 11/23/17. 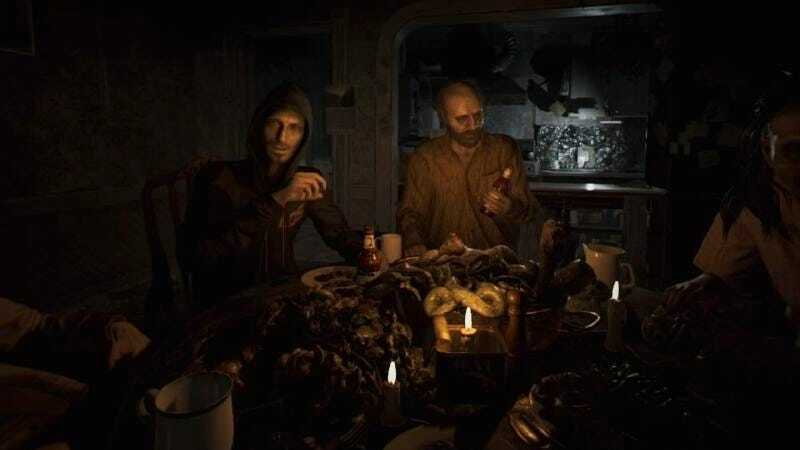 I’ve had a lot of strange food (like the earlier mentioned Resident Evil 7 Brain Cake from the Capcom Cafe), seen weirder ones that I was too scared to taste like a boiled ant dumpling soup and scorpions climb snowberg. A few years back, I wrote about some of the strangest foods in JRPGs. For this Thanksgiving as I get ready to eat way too much food (we usually eat Korean BBQ rather than the traditional turkey), I’m revisiting this list with many of the selections taken from suggestions by Kotaku and TAY’s hungry readers. Food has always been a part of the Zelda series, from Nasty Soup in Twilight Princess, to Bait in the original Zelda’s labyrinths. But Breath was the first to make it an integral piece of the gameplay. I think I spent more time cooking in Breath than almost all of the other side missions combined. And it is addictive. I poured countless hours into finding Hylian Bass, Razorclaw Crabs, and Hightail Lizards, just so I could make tastier dishes that gave me stat boosts and extra hearts (or weird dishes like the Monster Cake Narelle wrote about here). Cooking in Zelda inspired me to do some real life cooking. Unfortunately, most of it turned out tasting like Dubious Food and Rock-Hard food, which is what you get in Breath when the ingredients don’t mesh. The Dubious Food is so bad and strange, Nintendo actually had to censors the pixels. You can even meet with a Hylian chef, Moza, who teaches you how to make your failed dishes even more terrible to the point where you can create the “Ultimate Survival Dish.” I’m trying to cook it right this minute and I think I’m close to replicating the results. I’ll let you know tomorrow if we survive. The food in FFXV sometimes looks tasty and other times reminds me of the shokuhin sampuru, aka fake food, in front of many Japanese restaurants. In real life, shokuhin sampuru are plastic models made from polyvinyl chloride, sculpted to look like a given dish. In FFXV, there’s a lot of varieties when it comes to the cuisine, from Royal Road Paella, to Smoked Behemoths (no wonder Behemoths have been after you since FFII), and even Cup Noodles. But the strangest, and saddest, of the dishes has to be the Papa Bird and Baby Bowl. As the name suggests, the dish is made from two birds, a dad and his baby. It can only be obtained after you have the recipe for the Mother and Child Rice Bowl. I can’t help but feel that’s sinister and cruel, especially as both dishes are two of Noctis’s favorites. Who is the true villain of FFXV? According to those birds, you. Have you ever tried dipping pizza in soup? In Snatcher, Neo Kobe Pizza is one of the most popular dishes because of that combination. I think it all verges on what kind of pizza you’re eating. I like garlic cloves, onions, pepperoni, and gumbo soup. Wouldn’t mind throwing in miso soup and pineapples. Seems like an odd combination? It mirrors the tempo of Snatcher, infusing adventure games with films like Blade Runner, Alien, and Terminator. Add in a Metal Gear, and voilà- like the Neo Kobe Pizza, the taste will stay with you longer after you’re done. I love both Resident Evil 2 and tofu. But to play through all of Resident Evil 2 as a big chunk of Tofu is a surreal experience. Tofu wields a knife, takes a lot of damage, and unleashes tofu hell on the zombie legions. Its reward for going through the entire game? Becoming dinner for Hunk. For Tofu, humans are the real zombies. For my final selection, this is more of how a game reminded me of a personal experience. The main character, Max, goes to the Two Whales Diner where her friend’s mom works. Max is excited, stomach growling for the food as she has to decide whether to get a bacon omelet or Belgian waffles. When you check the menu, there’s even Big Foot themed choices available. I picked the omelet, started devouring it. Your friend, Chloe, comes in and asks you to prove you can actually change time. The part that disturbed me? There’s a massive roach in the diner that climbs up the juke box. They say for every one roach you see, there are supposed to be a thousand hidden behind the walls. That means the diner is infested with thousands of roaches. Normally, I get that it’s just a game. But it gave me a flashback to a time I was visiting my favorite restaurant and I saw one of the biggest roaches ever scurrying along the floor. I thought it was a freak incident, but when I went back a few months later, I saw baby roaches scattered about. On Yelp, someone even posted a picture from the restaurant with one of those big roaches boiled in their soup. All these memories hit me in an instant as the scene with the enormous insect crawling around the jukebox played in repeat. The weirdest part was they didn’t even react (and yes, I can acknowledge that the time travel thing was a lot more important at that moment). Like humans, roaches are a gregarious bunch, even suffering isolation syndrome if they do not hang around enough with other roaches. Roaches might be more like us than I’d like to think, but I still don’t like them anywhere near my food. There’s lots of strange food in the world and in gaming. Hope you have lots of the good kind tonight! Let me know of any I missed in the comments and I’ll end here with four additional mentions from Kotaku readers as well. It is imperative that someone mention the “Unspeakable Meat” from Dragon’s Dogma, which is plucked from the carcasses of dead Ogres dwelling in caves. one of my very favorite parts of River City Ransom was the wide variety of food and drinks that were available for purchase. That game was so awesome. Another interesting thing about eating in games (that I’ve always wanted to do a short piece on) is how the designers decide to portray eating food. My favorite is probably Harvest Moon’s way of pulling the entire loaf of bread out (or other food), holding it above your head, and then magically consuming the entire thing in one bite (really wish there was a gif of this). World of Warcraft actually makes your character sit down for ~20 seconds to eat/drink to restore mana and health (although you can somehow chug an entire potion in a second). Other RPGs like Fallout or The Elder Scrolls series will usually have some kind of biting/eating sound, but don’t actually show it happening (yet you can see NPCs eat food all the time...).